I'm feeling pretty under the weather today and I wanted to write a health-related post, something positive to channel my energy into. I started thinking about power spots, which are places where our inner self glows brightly, places (and times) from our past where we felt really energetic, centered, connected to the flow of life, and/or happy. Last summer, I attended my 20th high school reunion at The Athenian School in Danville, CA. My time at Athenian was one of the best parts of my life. It was my first time away from my difficult home-life, and it was expansive, supportive, intellectually intriguing, and full of wonderful adventures in the outdoors. 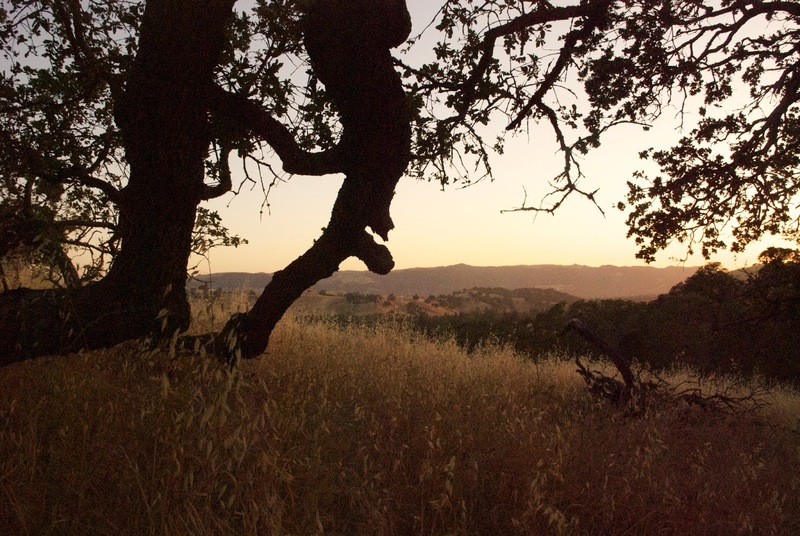 The campus is set at the foot of Mount Diablo, a Bay Area landmark, and State Park. The buildings are at the front of the property, while the back acreage is classic coastal oak and grassland hills and arroyo canyons. I moved to Athenian campus from Lomita, CA, a South Bay suburb of Los Angeles. 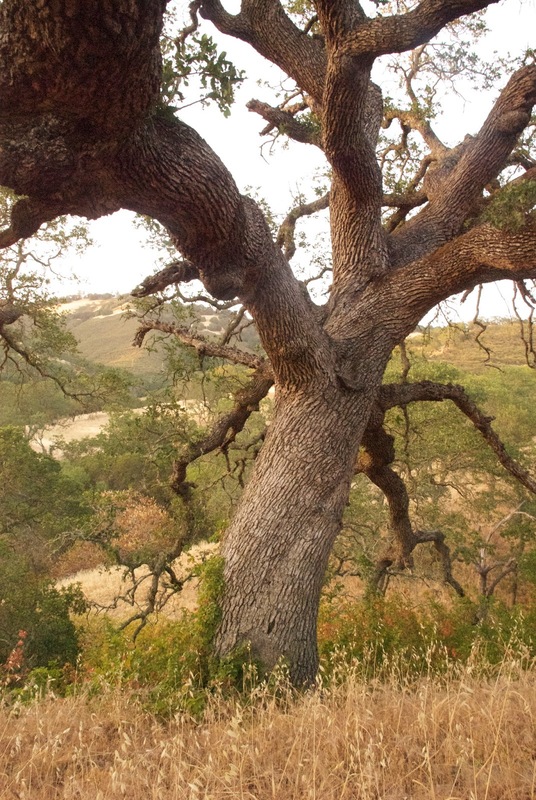 My dorm room had a west-facing window that looked out onto a grandmother oak tree, and crickets would sing at night. Nearly every day after school, I would head into the hills with friends, to walk the trails, and explore the dry creeks. Not long after I arrived in the fall of my junior year, my friend Evan offered to take me to the treehouse. We walked past the library and the meditation hut, and skirted the little creek. Then we headed up a wide-open grassy hill, following a rough trail through the brush. At the top, we picked up another little trail, a deer track, and continued up the spine of a hill. Eventually, we arrived at the tree, pictured above, which in those days had a wooden platform built onto the strong arms of the oak. To climb up to it, you had to get up onto a forked limb, inch along it, and the perform a curious little maneuver to arrive on the platform. I spent hours at this treehouse, with friends or alone, watching owls fly down canyon, watching the wind ripple the long grass in springtime, listening to crickets and birds, and just enjoying the beauty of the natural world. It was such a contrast to my life in L.A., and so full of real-ness, that I just loved it deeply and felt so very at home. When I graduated, I didn't realize how much I would miss it, until I thought of it again at my 10th and again at my 15th reunion, but circumstances at each prevented me from visiting. At my 20th, I wasn't going to let anything stop me! I set off after dinner in the evening, and arrived at sunset. There's now a more developed trail to the tree, and the treehouse was torn down for insurance purposes (go figure), but the place isn't any less special. I wasn't sure what I would find when I got there, but as soon as I sat down on the earth there, I could feel a very tangible sensation of energy borne of memory, and brought it fully into my present body: a power spot! These are places we return to when we are feeling down or sad, troubled, or overwhelmed, places that can fill us up from their well of goodness that we have cultivated with them. They fill our hearts and souls with happy memories, they are times and places where everything was "right". 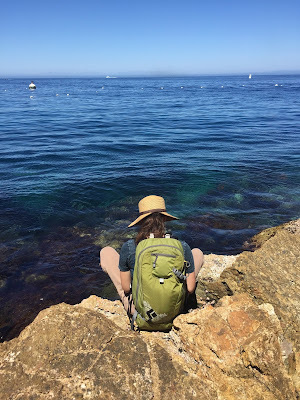 I recently rekindled another connection, with Catalina Island, a crazy intersection place of friendships and relationships and concepts that would affect my life for years to come. I had no idea at the time, but revisiting opened up another wellspring of connection that feeds my heart! I invite you to consider where these places are for yourselves, and fill up those empty spots in hard moments with the loving energy of the places that have most embraced you. The best part is that we don't have to physically visit these places to connect with them and have them help us. We simply have to remember ourselves there, imagine it, and see ourselves surrounded by it to enjoy the benefits. We can create our very own interconnected web of support.